Penn State junior forward Lamar Stevens will hire an agent and test the NBA Draft waters. He announced the news during a brief media session at the Bryce Jordan Center on Tuesday. "I thought I had a pretty good year for myself. I'm excited to just show my will to win in front of NBA people," Stevens said. "It was definitely a no-brainer, especially with the new rules." Those new rules, passed prior this season, allow NCAA players to hire an agent without losing their remaining eligibility. Stevens noted that he is still going to class, set to graduate a year from now, currently in the second semester of his junior year, academically. 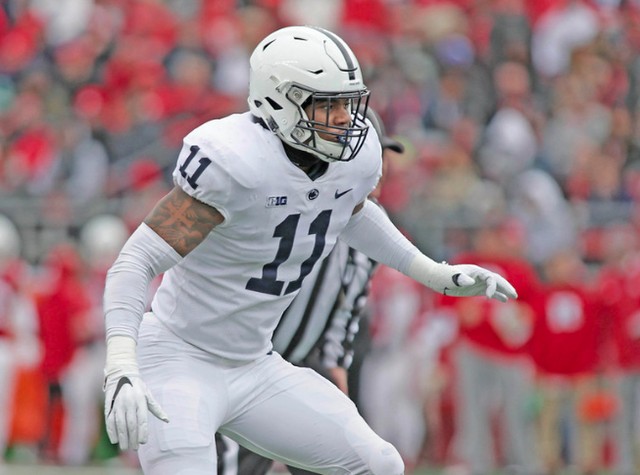 Stevens declined to comment on what feedback from the Draft Advisory Board would result in him leaving Penn State for a professional career. April 11th is the deadline for requesting an evaluation from the board. Stevens is also permitted to work out for NBA teams and can participate in the NBA Combine among other developmental events, if invited, held in mid-May. He was also noncommittal if the NBA and its various development systems was the only professional route he is willing to accept at this point. "When the time comes I'm going to sit and evaluate what teams like me and where they fall," Stevens said. "I'm going to discuss it over with my coaches and my family and come up with the best decision for me." Stevens is unsure of the timeline he is setting for a final decision, although an NCAA related withdrawal deadline would require that he remove his name from the process by May 29th. And if he were to return, Stevens knows that he will be heading back to a Penn State team poised to make a run in the Big Ten and potentially an elusive NCAA Tournament berth. Stevens averaged 19.9 points and 7.7 rebounds this past season for the Nittany Lions, good enough to earn first team All-Big Ten honors from the league's coaches, and second team recognition from the conference media. "I think we're going to be really good if I do come back," Stevens said. "You can just see the growth in the young guys...you saw already what our freshman guards can do and I think they'll be some of the best guards in the league." "The original reason I wanted to come here was to start a legacy," he added, just 554 points from Penn State's scoring record. "Of course it's important to me. That would be really cool to be able to break the scoring record. That would be an honor for me." Given the new rules and the career Stevens has had so far, Tuesday's news does not come as much of a surprise. And fortunately for him, there are no bad choices in the long run. "Honestly for me, it's a win-win," Stevens said. "One way I get to go play professionally. Two, I get to come back to a great school and really end my legacy how I really envision. If I do come back, we'll take this team to places it's never been." If there is anything you can gauge about Micah Parsons' personality -even from a distance- it's that he is incredibly confident.